I was ushered into a room, where I took a seat around a pedestal table large enough to seat ten. The top of the table was not made of wood or plastic, but was a drum head. Staff members started wheeling in these old men and sitting them around the drum table. 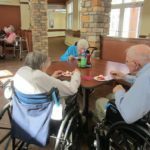 Most were hunched in their chair, some made small talk with each other or said hi to me, but for the most part the group was quiet and still. We tapped our fingers and played with different sounds the drum could make. 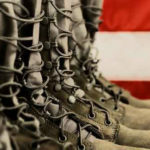 I don’t remember most of the details from that session, but as a newbie to the field—so new that I had yet to take my first music therapy class—I noticed the effect the music and the music therapist-led interventions had on the veterans. Playing together around that drum table caused them to physically relaxed, helped them make eye contact with each other, smile and laugh together. 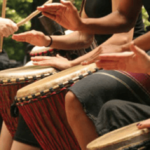 What started as a bunch of individuals sitting around a drum table ended as a warm and relaxed group, engaged with each other and sharing a common experience. 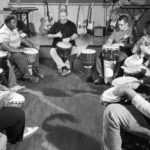 In this Psychology Today article Moore shares the highlights of a white paper titled Music Therapy and Military Populations: A Status Report and Recommendations on Music Therapy Treatment, Programs, Research, and Practice Policy. Nearly 65 years after volunteer musicians played in hospitals as a way to boost morale amongst WWII veterans through listening, music performance, and music-based leisure activities, music therapy has come full circle.